PART I – Straight news stories are supposed to avoid bias and report only the facts. The following headline and first two paragrapahs illustrate an example of a straight news story. A shocked international community has condemned North Korea after it launched four ballistic missiles on Monday morning, three of which fell into Japanese waters. Calling on Pyongyang to “stop its provocative actions,” the British foreign secretary, Boris Johnson, said the launches were in violation of multiple UN security council resolutions and threatened international peace and security. Why is this good reporting? SEOUL — U.S. missile launchers and other equipment needed to set up a controversial missile defense system have arrived in South Korea, the U.S. and South Korean militaries said Tuesday, a day after North Korea test-launched four ballistic missiles into the ocean near Japan. SEOUL — The United States started to deploy the first elements of its advanced anti-missile defense system in South Korea on Tuesday after North Korea’s test of four ballistic missiles, U.S. Pacific Command said, despite angry opposition from China. 1. Why is the Guardian’s story good reporting? 2. a) Consider the use of adjectives in the CBS and Reuters headlines. Which is the more accurate? Why? b) Re-read the first paragraph of the CBS News report. How does the reporter insert his opinion? c) Re-read the first paragraph of the Reuters article. The reporter writes that the U.S. has begun deploying the THAAD “despite angry opposition from China.” Why shouldn’t he include this phrase? 1. Why is this good reporting? The CBS headline “U.S. 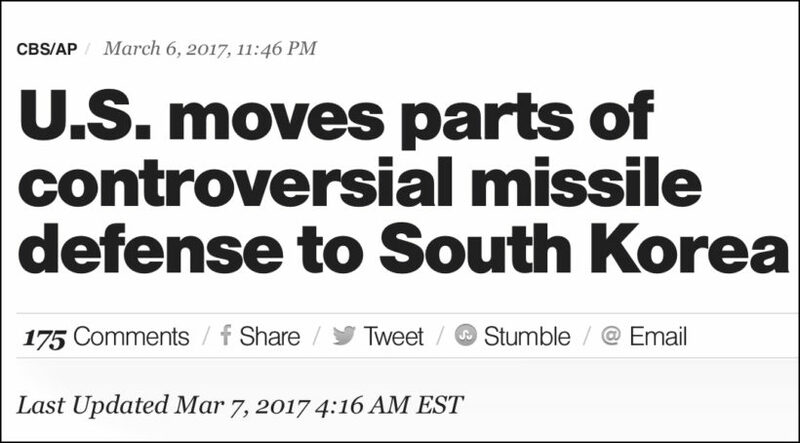 moves parts of controversial missile defense to South Korea” — with the sub-headline: “Deployment angers North Korea, China and Russia alike” is not accurate. CBS is an American news outlet. Who in the U.S. feels that the missile defense program is controversial? It was planned under President Obama and being continued under President Trump. It might be “controversial” in Beijing, but not to the U.S. audience CBS News reports for. The Reuters headline “U.S. starts deploying anti-missile system in South Korea after defiant North’s latest test” is more accurate. North Korea is violating multiple UN Security Council resolutions. The whole world is aware that its actions are defiant. -The reporter in the CBS article describes the deployment of our missile defense system as “controversial.” That is his opinion. It is not controversial to our allies Japan and South Korea. Or to Americans. Or to our European allies, who have all condemned North Korea’s aggressive actions. Saying it is “controversial” implies that the U.S. is doing something wrong, or that most people disagree with this action. When a media outlet uses spin in a news report, it gives the reader a false impression of the event.